The food crisis provides a perfect example of the deep interconnections. As Ahmed's book demonstrates, food insecurity is intimately tied to water scarcity, with agriculture consuming 85 percent of America's fresh water and threatening to bring about shortages in the foreseeable future. It's also closely linked to oil depletion, since every aspect of modern farming, from fertilizer to pesticides to machinery, relies on this dwindling substance. And there's an equally worrying connection to climate change, with studies having linked grain shortfalls to rising global temperatures. The food crisis also contributes to inequity, as big agriculture drives small farmers to the brink of survival; militarism, as states become increasingly vigilant in their efforts to quell hunger-stoked political protest; and environmental destruction, as industrial agriculture exhausts the very resources on which it depends. As Ahmed sees it, there are six main facets to our crisis: climate catastrophe, energy scarcity, food insecurity, economic instability, international terrorism and "the militarism tendency." His rationale for omitting water scarcity is that it relates so closely to the others he felt a separate chapter would be a bit redundant. Throughout his analysis, Ahmed maintains a proverbial glass-half-full perspective, reasoning that in this modern age we have the cumulative knowledge and wisdom of all previous eras "at our fingertips" for the first time in history. Because of the depth of his analysis and comprehension, one is inclined to believe in his optimism (and after all, when peak production of any resource arrives, by the very definition of peak there's still half left). Perhaps the most compelling support for Ahmed's optimism (and again returning to the example of food) is a 2007 study on the potential of organic farming methods, conducted by researchers at the University of Michigan. A common fear among gloom-and-doom prognosticators has long been that as industrial agriculture collapses under its own stupendous weight, we'll experience a worldwide famine of untold severity. But this extensive study shows that in addition to ameliorating environmental harm, organic, low-input integrated farming systems using little or no pesticides are also quite capable of supporting current and projected populations. They could increase global food production by as much as half, to 4381 kilocalories per person per day, which Ahmed calculates could easily sustain an estimated population peak of 10 to 11 billion people by 2100. Ahmed does, however, temper his optimism with realism, writing, "These crises are so unprecedented in their potential magnitude that without urgent preventive, mitigating and transformative action, they may threaten the survival of the human species." For instance, the Intergovernmental Panel on Climate Change (IPCC) predicts that current rates of global warming will render the planet uninhabitable by the close of the century. Also, experts on peak oil warn that the downslope of the world oil production curve could trigger an effectively permanent economic contraction, in addition to exacerbating climate change as we move to exploit ever dirtier fuels. And of course, the transition to sustainable agriculture won't look after itself–we could still doom ourselves to mass starvation by shortsightedly clinging to modern oil-intensive methods. Whether through careful foresight and planning or desperate circumstance, by century's end Western society will have made other arrangements for literally every aspect of daily life, predicts Ahmed. The bottom line is that the global political economy as we now know it won't survive past this century. It must undergo profound structural changes that shift it away from neoliberal capitalist ideals such as free markets, deregulation, ultra-materialism and unlimited growth at the expense of the very natural capital that supports the economy. To this end, Ahmed presents what he calls a "tentative template" for a post-carbon world. At the heart of this template is the recognition that neoliberal industrial capitalism is a failed model, the depth of whose failure was clearly evident during the global banking crisis of 2008. If unrestrained capitalism really is the pinnacle of human economic progress, asks Ahmed, then why were neoliberal economists collectively blindsided by this crisis, and why did the ensuing interventions run counter to neoliberal free market principles? Why has world capitalism been in a "long downturn" since the early 70s, and why do capitalist nations have such great inequities and rates of mental illness? Most of all, why does neoliberal capitalism fail to see that in ravaging the biosphere it's spelling its own demise (with the Stern Review memorably calling climate change "the greatest market failure the world has ever seen"*)? In the concluding chapter, Ahmed broadly discusses the reforms that he sees as necessary. Drawing on Marxist theory, he argues that a tenable new global political economy must grant workers more equal access to productive resources; help banks promote widespread productive ownership; place vital resources like water and energy into a Global Commons that is immune from monopoly by an elite; pursue sustainable growth benefiting the majority, not growth for growth's sake; and of course, subsist on renewable resources. He emphasizes that civilizational renewal can be brought about only by grassroots communities working to fundamentally reconfigure the system, not by those proposing mere "policy changes." * N. Stern, Stern Review on the Economics of Climate Change (pre-publication edition; London: HM Treasury, 2006), viii. 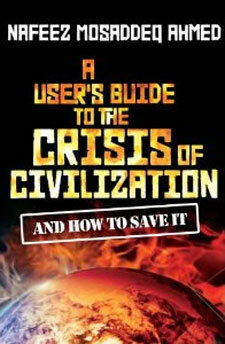 ** Nafeez Mosaddeq Ahmed, "Campfire: A User's Guide to the Crisis of Civilization: And How to Save it," The Oil Drum, Nov. 15, 2010, http://www.theoildrum.com/node/7110 (accessed May 7, 2011). † "Welcome–Nafeez Mosaddeq Ahmed,"Media Monitors Network (MMN), a service of MMN International Inc., nafeez.mediamonitors.net/background.html (accessed May 7, 2011); "The Institute," The Institute for Policy Research & Development (IPRD), http://iprd.org.uk/?page_id=27 (accessed May 7, 2011); Wikipedia contributors, "Nafeez Mosaddeq Ahmed," Wikipedia, The Free Encyclopedia, http://en.wikipedia.org/wiki/Nafeez_Mosaddeq_Ahmed (accessed May 9, 2011); Ahmed, interview with Alex Smith, "Radio Ecoshock 110128: Hello Hard Times," The Radio Ecoshock Show (originates from Co-op Radio CFRO 102.7 FM in Vancouver, Canada), Jan. 27, 2011, http://www.ecoshock.info/2011/01/hello-hard-times.html (accessed May 7, 2011).